Moving back to the torso for the anatomy basics posts we will move down to look at some of the muscles that attach the pelvis to the upper leg bone. These muscles play an active role in moving the leg for such functions as running or walking. They also help with stablizing the torso when standing. Understanding how these muscles cooperate will help us understand the movements the muscles makes at this joint. Today, we will look at the muscles attached to the pelvis, to see the general shape, points where these muscles are attached to the skeletal structures, and how the muscles move the leg. The gluteus maximus is the largest of this group of muscles. This muscle is also the closest to the surface of the body. The muscle is attached at the top posterior side of the pelvis on the illium and runs down the the back to attach to the upper part of the body of the femur crossing the back of the bone. This muscle is somewhat fan shaped. It is a wide muscle where it connects to the pelvis and becomes much narrower as it moves down to connect to the leg. The gluteus maximus will extend the thigh when the muscle is engaged. The thigh will be pulled back until the leg is straight as compared to the torso. Action: Extends the leg at the hip. The gluteus medius is a smaller muscle found underneath the gluteus maximus. This one starts in a similar place on the illium and attaches onto the greater trochanter of the femur at the other end. Like the previous muscle, this one is wider at the top and narrows as the muscle comes to attach to the leg. 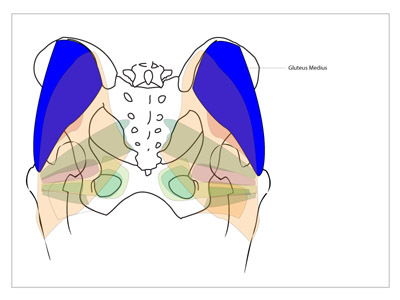 Though in a similar position the gluteus medius performs a different action than the gluteus maximus. It pulls the leg out away from the body at the hip and helps rotating the thigh. 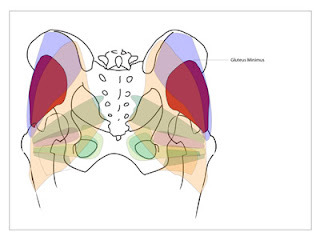 The third gluteus muscle is the deepest of the three. You will find it tucked underneath both the gluteus maximus and minor muscles. The gluteus minimus also attaches to the illium at the origin and the greater trochanter at the insertion. Like the other gluteus muscles it is wider at the top and narrows as it reaches the leg. 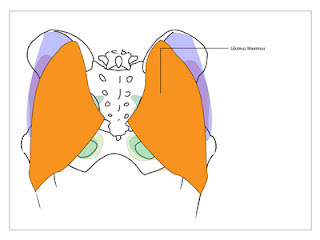 The gluteus minimus works much like and with the gluteus medius. That is it will pull the leg away from the center axis of the body and rotate the leg at the hip. 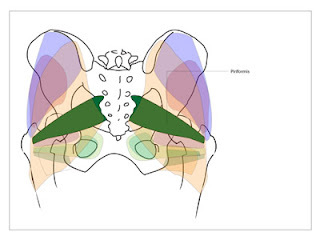 The piriformis and the rest of the muscles discussed below are not muscles found close to the surface of the body. These muscles are all covered by other muscles. In the case of the piriformis, the gluteus maximus lays on top of the muscle. The piriformis arises from the sacrum and ends on the back of the greater trochanter on the femur. The pririformis rotates the leg. It turns the leg outwards or laterally, meaning that when engaged the muscle swings the toes away from the body. There are two gemellus muscles attached to the pelvis. The one attached higher up on the pelvis is the gemellus superior. 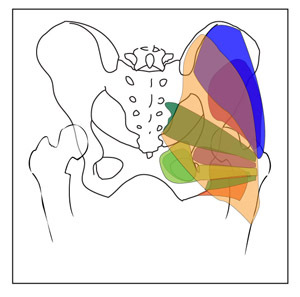 This one originates at the part of the pelvis call the ischium, basically the lower portion of the pelvis. The muscle then inserts itself into the leg via a tendon. Like the piriformis, the gemellus superior rotates the leg laterally. Being attached to the back of both the pelvis and the leg bone, as the muscle contracts it pulls the back of the leg closer to the back of the pelvis. This causes the leg to rotate out. The gemellus inferior works along with the gemellus superior. This one is also attached at the bottom of the pelvis, the ischium, at its origin. Its origin is lower on the ischium than the gemellus superior. The muscle connects to the femur near the greater trochanter. The gemellus inferior work with the gemellus superior performing the same action. It pulls the back of the femur towards the pelvis causing the leg to rotate laterally. This one looks like a wide band stretching from the ischium of the pelvis to the inside of the femur. 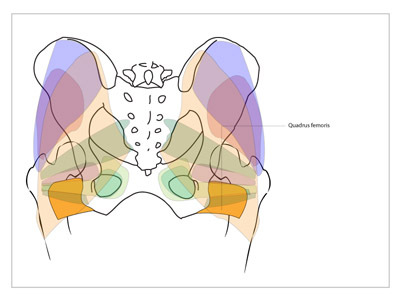 We use the quadratus femoris muscle to again rotate the leg laterally or outwardly. We also use this muscle to adduct or pull the leg in towards the center line of the body. 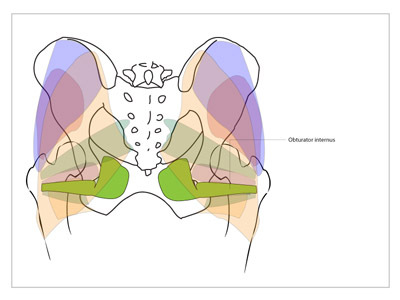 The obturator internus is yet another muscle beginning at the lower part of the pelvis. This one covers the hole found in the ischium called the is ischiopubic ramus at the point of origin. It then attaches to the femur at the greater trochanter. The obturator internus performs two functions. Again, it assists in rotating the leg laterally. The muscle also abducts the leg, drawing the leg out to the side way from the body. The muscle uses the joint like a lever to pull the leg up. The second of the obturator muscles is the obturator externus. This one has simmular origin and insertion points as the obtutartor internus. Except this one sits on top of the obtutartor internus at the origin. The muscles also performs two tasks. One is it rotates the leg outwardly or laterally. The other is it adducts or pulls the leg in towards the center line of the body. Unlike the obturator internus this muscle just pulls inwardly, there is no lever action. The gluteal muscles will help define the shapes and forms of the body found at the pelvis and upper leg. Combining the muscle information with the skeletal landmarks will give us a sense of where these muscles begin and end, helping define the shapes we see. 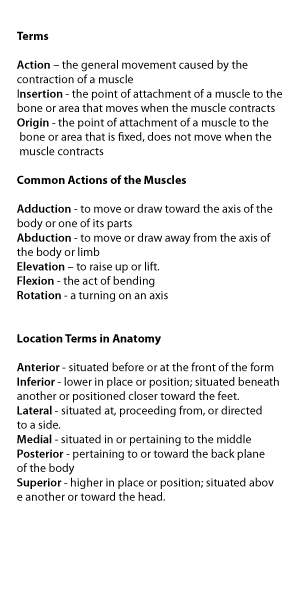 The learning about the other muscles mentioned above tell us more about movement at the hip more than form and shape. Understanding these muslces will help us figure out what movements are possible at the hip joint and allow us to better illustrate such actions.